It is important to spend a lot of quality time picking out the kind of seating that best suits the needs of your church on an aesthetic and functional level. 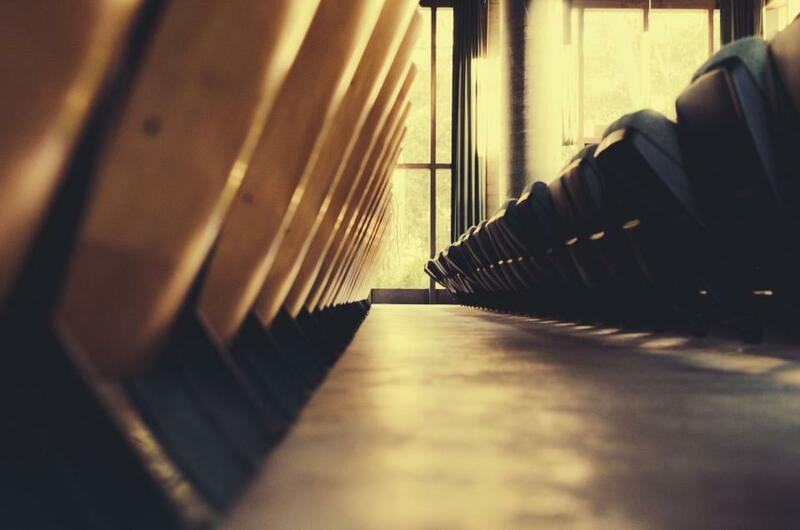 However, whether you are currently immersed in the planning process for designing your church from the ground-up or reconfiguring an existing space, you should get a sense of the specific seating needs of your church by calculating the seat capacity. Analyzing the capacity is a bit more involved than a simple calculation, in most cases. You will likely find that thinking about physical capacity will also push you to think about ways you can maximize the layout of your church, which will in turn, give you a clearer vision of what you want your church to look like. This is one of the most important things to keep in mind when thinking about church design because of one simple reason: most churches equate the two and thus overestimate the amount of seating in their space. While this article will describe how to calculate maximum seating capacity, this is calculated solely for safety reasons and not to dictate how many seats you should put in a space. It may seem like you want to fit as many people into your church as possible so as to encourage attendance, but you will find that even overcrowding your church by a little bit could easily have the opposite effect. Just as you will pick pews or chairs with comfort and accessibility in mind, you should calculate maximum capacity in line with those same ideals, and remember that your church is probably smaller than you think. It is best to adhere to ICC’s International Building Code when thinking about the maximum number of people can occupy a space, since the site features a breakdown of specific safety references by state. The section that deals with spaces in which there is fixed seating is a bit on the unhelpful side: “For areas having fixed seats and aisles, the occupant load shall be determined by the number of fixed seats installed therein.” (1004.7) If you are trying to plan a space, then this guideline doesn’t bear much fruit, though should be a reminder not to necessarily factor standing room into capacity. If you are still planning your space, then it is more helpful to look at the limitations regarding spaces that do not have fixed seating, which is also considerably more helpful if you are looking into seating like light chairs that can be moved and rearranged easily. According to the code, maximum occupancy in a concentrated (unfixed chairs only) necessitates seven square feet per person, and allowing only five square feet per person for standing room. (Table 1004.1.1) Thus, calculating maximum occupancy just means dividing the square footage that the chairs are consuming by seven. It is also good to note that stages require fifteen square feet per person, which should help you plan the square footage of the stage area if you haven’t already. If you are currently trying to envision such a space, it may occur to you that those dimensions seem a little cramped. These kinds of calculations, therefore, should only be made with safety in mind, and should not at all dictate what the space looks like. Any churchgoer who has ever been stuck in a crowded service can attest to that! In other words, if you are at 100% capacity, then you are way too full. You should always aim for around one-fourth of the space to be clear. This seems excessive until you and the participants see it in action and realize just how comfortable it is compared to the alternative. If the minimum amount of space is seven square feet per person, then you should expect to accomodate for around twice the minimum. You should budget for ten to twenty square feet per person, depending on the size of your space. Assuming your church is not aspiring to reach a capacity beyond 300 or so, you can anticipate accommodating for around fifteen square feet per person, give or take. Remember that this just applies to the worship area, and not lobbies or standing areas, where you might be able to squeeze a bit more. In your calculations, you should also take into account the width of the aisles, which should be at least five feet in length (or if you have multiple aisles in your church, the main one should aspire to this length, if not more). You want there to be plenty of space for processions, so make sure not to skimp on aisle space in an attempt to cram more people in. Once you have divided the square footage of your space by the square footage per person (as it applies to the entirety of the worship space, though not the altar space), you should have a clearer idea of how many seats you will need. Of course, it is difficult to give exact guidelines, since every space is different, but the main takeaway is: do not just meet the minimum ICC guidelines! There are two more tips you should take into account that may impact the seating capacity of the space. This allows you to do two things: more easily delineate the seating capacity of a space, since one chair admits one person (while pews can vary wildly), and secondly, can actually allow you to fit more people into your church. If you are particularly concerned that the space of your church will not admit the number of people you would like, chairs are a great option for allowing you to expand your audience without sacrificing comfort, and giving you a space you can easily rearrange and move around at will. Churches notoriously fail to plan for the less-obvious areas that will allow the church to function smoothly into the future. Making sure to allow plenty of breathing space while still supplying the church with the requisite number of storage closets and other working spaces will save you a lot of frustration in the future! Following these guidelines will really help your worship space stand out in a world where many old churches, while often very beautiful, fail to meet modern standards of comfort and convenience. The more physically at ease the congregation is, the more likely that they will keep wanting to return to your church. Atmosphere should not be underestimated in church planning, and you may be surprised about how well an airy, open space can facilitate deeper thought and engagement.